Leizhan has extensive offerings of paper making equipment and services in paper and pulp industry. Leizhan is committed to offering reliable, tailored paper production solutions and services that best fulfil paper plants’ needs. The target of Leizha is to reduce the operating cost, improve efficiency and constantly work out new paper manufacturing solutions for paper mill. Components of Leizhan specially designed 3200 Fourdrinier Multi-cylinder Culture Paper Machinery solution contains: Air cushion head box, Fourdrinier table, Suction couch, Suction move roll, Four roll three press suction combi-press, Main press, Dryer section, Sizing machine, Horizontal pneumatic paper, Winding machine,Chrome-plated cylinder, Operating platform, open-hood, Lubricating station, Broke paper device, Mechanical drive, Frequency drive sectional transmission, Lead paper rope system, Calender. 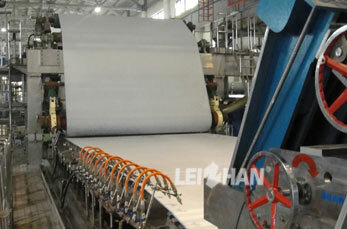 Leizhan Cultural paper machinery has the width range of 1880-3750 mm, and the basis weight range of 40-80 g/m². With the operating speed range of 200-1200m/min, it can produce 20-270 tons high grade cultural, carbonless paper per day.